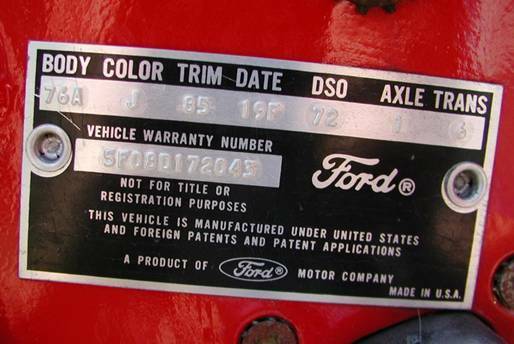 I have a 1965 Convertible mustang I have restored and the door tag has been missing ever since I acquired the car. Previous owner thinks that the driver side door was replaced and the tag was pulled off in the 70's and never put back on. I know I can have a tag reproduced however I am struggling with the code for the date. My vin number is 5R08A138936 and the car appears to have been Caspian Blue on the exterior with a blue standard interior and a white top. Any suggestion as to how I might best replicate my original door tag with the proper codes, particularly the date code? it so the paint and detail doesn't wear off. Thanks for the reply, I know where to get a replacement tag. My question was regarding the date that goes on the tag. I’m hoping someone can help me determine the build date for my car based on my vin number. As there are no records anymore from Ford, I would like to determine a date as close to the original build date as possible. VIN or the Vehicle Warranty Number? give the vin to kevin marti and he can figure out a date that is close enough. Have to renew tag this month. Any ideas for a personalized tag?